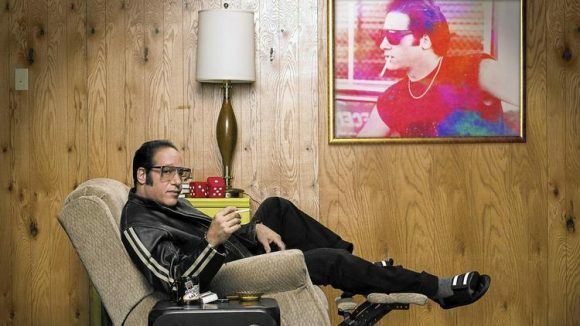 “There’s a strong element of nostalgia in Dice, Showtime’s nobody-was-really-asking-for-this comedy featuring Andrew Dice Clay — and that’s just in the opening credits. Starting with footage of the controversial comic from his arena-filling heyday, the series proceeds to introduce him, not very imaginatively, as a slightly worn-down version of himself, eking out a living while enduring various indignities in the colorful confines of Las Vegas. The show has its moments, spread over six episodes, but as showbiz perches goes, this one is hardly the top of the world, ma.” — Variety. “In his hugely successful prime, Andrew Dice Clay, the leather-bound, cigarette-smoking, you-kiss-your-mother-with-that-mouth comedian, was like nails on a chalkboard to me … In his decline, relatively speaking, Clay has become a more interesting figure, willing to play in the space between the human being and the collection of attitudes … With Dice, he’s allowing himself to be flawed and fearful in a way that his stand-up comedy never could. Clay has remade his career and his persona for the better, handling the complexities with ease, and it’s genuinely funny.” — Los Angeles Times. “Episode 2 is hilarious. Adrien Brody, playing himself, spends that show doing the Method-actor thing of studying Dice in preparation for a stage role that requires machismo. By the end, he’s more Dice than Dice. An episode featuring Criss Angel, the ‘Mindfreak‘ illusionist, is also quite funny, and practically every instalment is enlivened with attention-getting guest stars from the Las Vegas scene. But the series, created by Scot Armstrong, invests an awful lot in the comedic value of crassness, and the result is only a 50-50 success rate.” — New York Times. “The show is built around the idea that Dice is not like the misogynist and generally misanthropic oaf he has played onstage since the late 1980s. Only he is like that, sort of. Living off the fumes of fame in Las Vegas, Dice is prone to kvetch about any mild irritant (ATM fees at the casino, for one example), which easily turns him into his bombastic stage persona — or an older, creakier version of it. Dice is mostly a warmed-over attempt to ape Larry David’s Curb Your Enthusiasm, with just a dose of the existential despair seen in Louis C.K.’s Louie.” — The Washington Post.